NEW YORK - Estelline Pike is a compulsive throat washer. She's compulsive also about sword washing. Instead of soap and water, Mrs. Pike uses medicinal antiseptic. Now Mrs. Pike, 53, isn't slipping. 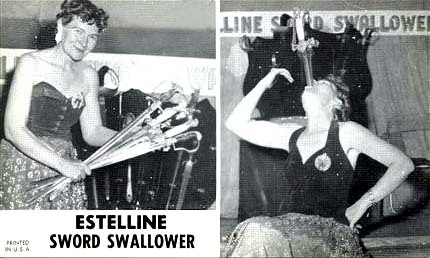 She's a sword swallower who believes in being hygienic. The widow and grandmother has been slipping swords down her well-washed throat for 33 years - and se isn't about to retire. On Sunday she ended a seven - week stint with the Ringling Bros. and Barnum and Bailey Circus is New York. "I'm going to sleep for a few days and then look for a new job." she said in an interview. "That's the one nice thing about sword swallowing. You can always find employment." Mrs. Pike said she's compulsive about sword and throat washing to protect herself and the skeptics who want to handle the swords. "The skeptics" she said "want to handle them after a show. They think there's trickery involved and that I'm not swallowing real swords. "The kids get cotton candy on the swords and the adults sometimes try to bite them." The swords that Mrs. Pike swallows have blunt tips and blunt edges. "If they didn't she said, "I would cut my throat." Fast as you might slick a pin into a cushion, Mrs. Pike can slide a 22 inch sword down her throat. Her throat is so educated that it doesn't misbehave when she comes to the climax of her act - gulping six swords at once! Mrs. Pike, whose home is in Hoxie, Kan., taught her son, James Ball, to swallow swords when he was 11. She said he's now a professional swallower working out of New Orleans. "You might say I swallow swords to keep busy and to keep from starvation." Mrs. Pike said. "I really want to be a singer. I've written more than 50 songs and I'm a jazz pianist. "An opera star once told me I should take up singing because I have a tremendous throat."